1896: John Dean, age 75, living on his farm on Acton Street, was murdered by Lorenzo Barnes. Dean was struck on the head with the back side of an ax and robbed of approximately $70 he had on his person. Barnes did odd jobs around town, including for Dean. He was frequently intoxicated. He was arrested because he was spending more money in town than he typically had. In evidence were his bloody boots recovered from the Assabet River. Barnes was the second to last person in Massachusetts to be executed by hanging. After that, it was the electric chair until executions ceased in 1947. 1912: Cora Olsen, 19 years old, was shot several times by Charles Lowrey, a young man she had been dating for several years. Olsen had joined the Navy, deserted, returned to Maynard, was drinking heavily and no longer welcome at the Olsen household. After the shooting, Cora ran to the nearby mill for assistance, leaving a bloody trail behind her. Doctors were swiftly contacted by telephone, as were the police. Lowrey was apprehended in South Acton trying to catch a train to Boston, where he had re-signed with the Navy and was expecting to ship out shortly. Olsen recovered from her wounds. 1919: Luigi Graceffa, age 30, found floating in Charles River, knife wounds. He had testified as a witness in a murder case in Waltham, and this was thought to be a revenge killing. Later the same year, Joseph Graceffa, Luigi's brother, along with two friends, opened fire shortly after noon on two men who were visiting from Fitchburg. Joseph Sipoli died. Rizzo Dianisa survived a serious bullet wound to the head. The attack was in thought to be in retaliation for Luigi's death. 1921: Hannah (Ingerdella) Johnson, age 24, was shot at 7:20 PM, while walking on Main Street with her husband. By her husband. The young couple had been married for just over a year, but the marriage was strained, and reports of the time state that Mrs. Johnson intended to file for a divorce. After shooting his wife, Walter Johnson lit a cigarette, sat down next to her body, and shot himself through the chest. He died about 20 minutes later, smoking to the very end. Police found a note on the body that read in part "...I bought the gun to do this act. You [Hannah's uncle and aunt] will never understand why I would do such a thing." Sometimes a newspaper article from the period cannot be found in the microfilm records, so all that exists is the town's Annual Reports listings of dates, deaths and causes. From this we get 1909; Joseph Fiorentino, bullet wound; 1915: Stefana Terrasi, revolver shot, 1916: Jeannie Marie Clark, bullet wounds; 1923: Rosario Buscemi, bullet wound; 1924: Oscar Hietala, bullet to head; 1924; Frank Vodoklys, pistol shot. Unfortunately for historians, the deaths reports stopped listing details after 1927, so from then on only the annual police reports. The decade 1930-40 notched nine manslaughter deaths, but without details. 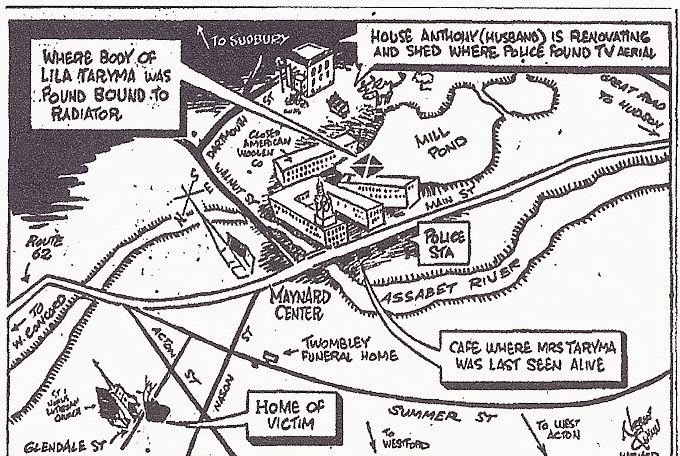 1953: Referred to in the Boston Globe as the "Mill Pond Murder," Lila Taryma, mother of four, disappeared the Saturday evening before Easter Sunday. Her body was found seven weeks later in the Mill Pond, lashed to a heavy radiator. Cause of death was head injuries. Her husband, Anthony Taryma, was initially charged with her murder. They had been seen arguing at a bar that evening, but he left and she remained. Anthony was not brought to trial due to insufficient evidence. He moved away, remarried, died years later in an automobile accident. 1901: Joseph Fredesco, age 18, was found dead in the Assabet River. Fredesco had been in the country just two weeks, in Maynard just two days, and was employed with a railroad work crew as water boy. He had eaten the noonday meal with co-workers, but his absence noted late afternoon led to the search that found his body early that evening, upstream from the Ben Smith Dam. An examination discovered a head wound on the right side, bleeding from the left ear, and multiple bruises on his back, although the actual cause of death was drowning. The supposition was that he had gone to the river bank to bathe in the shallows, his clothes being found on the riverbank, and was attacked there by a person or persons unknown, then pushed into the river while unconscious. Fredesco did not know how to swim. This was the third sudden death in Maynard within 24 hours, but the other two were clearly natural causes. In a non-fatal incident that same 4th of July week, Richard Parmenter was shot in the thigh while walking down a street with his daughter. It was determined that the bullet was from a stray rifle shot from some distance away. Unlike others mentioned in this column, Parmenter was not a recent immigrant - his family had crossed the ocean in 1639. Dr. Frank U. Rich came to Parmenter's house and removed the bullet with a forceps. The newspaper account did not mention any use of anesthesia, and this was decades before the invention of antibiotics. Parmenter survived his wound - Glenwood Cemetery records have him dead and buried in 1934. From an 1899 news item, Dr. Rich was the first citizen of Maynard to own an automobile. 1915: Stefana Terrasi, age 27, was shot dead on a late Sunday night in April in the front hallway of a house not his own. Police identified him as living in West Concord and working at the gunpowder mills. The medical examiner determined Terrasi had been shot three times from behind. Given the position of his body - face down, head away from the entrance - the thinking was that he had been trying to get away from someone he knew (or else had recently meet and deeply offended). A news report at the time mentioned that "...there was a crowd of people about the place all the afternoon, Sunday, and there was a great deal of noise and evidences of drinking." 1923: Rosario Buscemi, age 38, shot in an apartment building on Main Street. He and his brother had gone there to confront someone. When that person would not open the door the brothers started shooting at the door. The occupant shot back through the door, hitting Rosario. His brother fled to New York, where he stayed and raised a family. 1924: The town's annual report listed two men dead from bullet wounds to the head, but perusal of newspaper accounts found both to be suicides. Frank Vodoklys, age 59, immigrant from Poland, was despondent over the failing of his meat and provisions business (in the building now Morey's Tavern). Survived by his wife and five children. Oscar Hietala, immigrant from Finland, age 45, had recently learned of his wife's death, in Finland. He had taken to drinking heavily (despite this being during Prohibition). Survived by four children in Finland. Nationally, there were peaks in murder rates from 1920-1935 and 1970-1995; both periods exceeded eight per 100,000 population per year. Current national rate is 4.5 per 100,000 with Massachusetts at two per 100,000. There are some interesting theories as to why murder rates go up or down, such as up during bad financial times or popularity of new illegal drugs creating violent competition amongst sellers, down from better policing, more violence-prone people in jail for lesser crimes and the availability of birth control reducing unwed mother pregnancies. One novel theory is that childhood exposure to lead (from lead paint and leaded gasoline) results in violence-prone adults, so as blood lead levels decreased nationally so did murders, decades later.